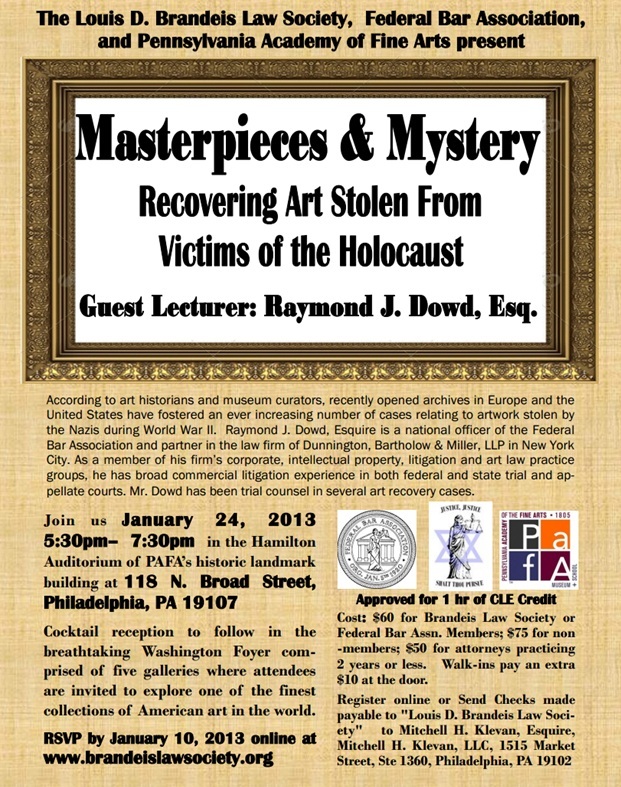 Last Thursday I spoke on Nazi art looting at an event hosted by the Brandeis Law Society and the Federal Bar Association at the Pennsylvania Academy of the Fine Arts. The event was well-attended despite bitterly cold weather with 75 attendees. The Hon. Sandra M. Moss introduced the program and Frank McGovern, President of the Eastern District of Pennsylvania Chapter introduced me. Thanks to the hosts for the wonderful hospitality. The audio program is available now on the Federal Bar Association website here, together with a PDF of my powerpoint, so that you can follow along and get the visuals. Below is the description from the West LegalEdcenter website, for more information and signup here. 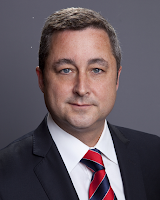 Ray Dowd, author of West’s acclaimed Copyright Litigation Handbook and a partner in Dunnington Bartholow & Miller LLP in New York City will take us through 2012’s copyright litigation cases. Copyright law is fractured, contradictory, and rapidly evolving. U.S. courts of appeals decided many important copyright issues in 2012. Ring in the New Year by tuning in to get the highlights. As we look at the past year’s most memorable copyright litigation cases, Dowd will describe their significance and what the rulings could mean to you and your clients. Listen in for an insider’s account of the tactical and strategic choices that litigators faced in 2012. Wondering where we are on the first sale doctrine? Scratching your head over what a derivative work is? Wondering what impact the digital world has had on cases this year, and what the future of copyright infringement litigation is? This hour-long CLE and its accompanying materials is the “cheat sheet” you were looking for. Dowd’s Copyright Litigation Handbook is the first publication aimed at the practitioner who must make quick practical decisions in the heat of battle and evaluate the immediate procedural consequences. Copyright Litigation Handbook devotes attention to procedural case law that rarely reaches the appellate level, but is of critical importance to the life of everyday practitioners. The New York Law Journal called Dowd’s Copyright Litigation Handbook “an indispensable guide and supplement to the ins and outs of copyright litigation…”. Join us for a lively session on a hot topic. For more information on Copyright Litigation Handbook 2011 ed, please visit the Thomson Reuters Westlaw Store here. I hope that you will be able to join us at this wonderful venue in Philadelphia on Thursday, January 24. Special thanks to the Brandeis Law Society, the EDPA Chapter of the Federal Bar Association, the EDPA Chapter of the Federal Bar Association, Judge Sandra Moss, Samantha Zipkin, Frank McGovern and Gregg Kanter for making it all happen. Click here to register.